This exhibition is the fourth in what has become an occasional series reflecting the Gallery’s long-term interest in artists’ cartography. 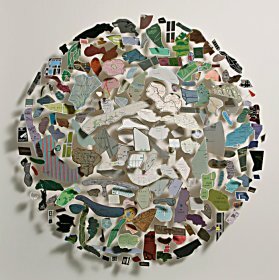 It brings together new work by gallery artists and others who work with maps and map-making strategies. This particular exhibition came about at the suggestion of Katharine Harmon, as a complementary event for the British launch of her new book, The Map As Art: Contemporary Artists Explore Cartography (Princeton Architectural Press). The exhibition revisits and includes some iconic editioned map works, such as Michael Druks’ self-portrait print Druksland – Physical and Social of 1974; and Cornelia Parker’s Meteorite Lands on Wormwood Scrubs, one of the series of multiple works she made in 2000 to mark the millennium. Other ‘icons’ include Jugoslav Vlahovic’s famous surrealist photograph from the 1970s, World Cow, in which the markings on a cow form a world map; and Layla Curtis’ lithograph of 2001, World Political, that discreetly subverts the normally trustworthy standard world map. 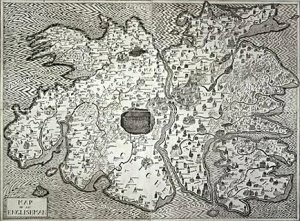 Grayson Perry’s 2004 Map of an Englishman is an extraordinary, highly detailed etching that illustrates an imaginary island surrounded by ‘seas’ such as Delirium, Schizophrenia and Paranoia. The island itself is inscribed with place names, counties and geographical features chosen to represent Perry’s ‘prejudices, fears, desires and vanities’. 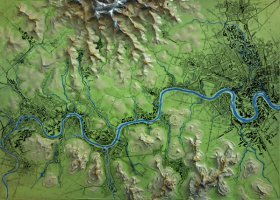 For several Gallery artists, in particular Jason Wallis-Johnson and Chris Kenny, the visual language of maps and map-making has become an integral part of their practice. Jason Wallis-Johnson’s recent silicone map drawings, like his lightbox maps, are made with persistent process, and reflect his literal obsession with maps – microscopic cities and landscapes made with jewel-like detail have references to maps, architecture and population statistics. The artist often makes subtle shifts or completely recreates existing maps of places ­­– in London USA, he re-imagines London as if drawn and planned by an American cartographer. In Chris Kenny’s three dimensional collage constructions, undulating raised shapes and lines cut from maps replace the cartographer’s logic ‘with an absurd imaginative system where unlikely combinations allow one’s mind to ricochet back and forth between disparate locations and associations’. Like Layla Curtis’s World Political, Kenny’s map works have an affinity with the 1929 Surrealist Map of the World. Damian LeBas’ inscribed maps were exhibited in Paradise Lost, the first Roma pavilion at the 2007 Venice Biennale. 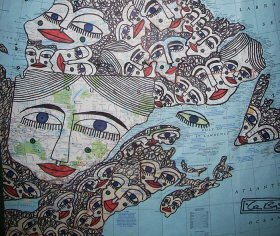 He says that Gypsy maps are invisible, ‘existing only in the mind and within communities’, but the myriad faces of his Gypsy travellers who populate and spread as he draws them over paper continents, form what he describes as ‘a kind of artistic conquest to make people think’. 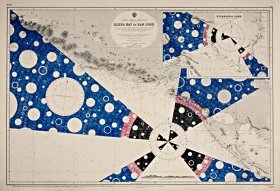 Terry Ryan also uses maps as a support and base in his on-going series of old naval charts – they are overlaid with his idiosyncratic thoughts and graphic devices, and transformed into maps of ‘somewhere else’. Alberto Duman makes descriptive word maps of real places, and provides a different perspective on some of London’s landmarks – conventional ‘postcard’ views have been subjected to a process of textual substitution that conceptually ‘maps’ the image. 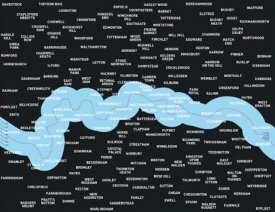 In Richard Wentworth’s print If London Looked in the Mirror, the artist rearranges the place names and re-thinks the map of the city, twinning the boroughs, as a way of making Londoners ‘reacquaint themselves with their city’. Jonathan Callan uses process to alter the original form of maps as part of his fascination with materiality: in his work Scilly Isles, strange, almost ominous forests and growths of black silicone have sprouted over the islands – perhaps as a result of the sub-tropical climate warmed by the Gulf stream. 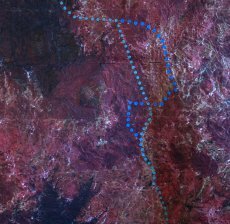 Satomi Matoba uses seamless digital manipulation to produce maps that are utterly convincing in their digital reconstruction of histories and unnerving, unexpected juxtapositions. Tom Weld makes paintings that are ersatz maps of terrains that exist only in his mind; yet they are entirely convincing and resonant with the political statements of their label titles, such as Border Dispute, Enemy Territory, and Collateral Damage. Paul Tecklenberg’s Lost Islands of the 21st Century is a ghostly photogram that suggests a treasure map of a lost island, and implies future submerged areas that will occur as a result of climate change and global warming. Margaret Proudfoot excises all but the roads from her maps of Kabul and Baghdad, reversing them so that all is white, all content obliterated, with the lace-like quality of a Muslim prayer cap. Jason Wallis-Johnson: Thames River Systems (2009). Grayson Perry: Map of an Englishman (2004). Chris Kenny: Start and Finish (2008). Terry Ryan: Relocation, Elena Bay to San Jose (2005). Tom Weld: Border Dispute (detail), (c.2005). Damian LeBas: Quebec and New Foundland (detail) (2006). Richard Wentworth: If London Looked in the Mirror (2005).